Thank you everyone who has contributed to the discussion! I really appreciate your input and especially the varying points of view. - Avoid pitfalls of the fighter role, including binary performance entirely dependent on closing to melee. In plainer terms, we want Volibear to reach melee somewhat more consistently but not become massively threatening until he spends a little bit of time there first. - R cast while moving, enough said. I also discussed our approach with Live Design, who are enthusiastic about the direction. I will try to get the changes into playtest soon, and will post more updates as I can. 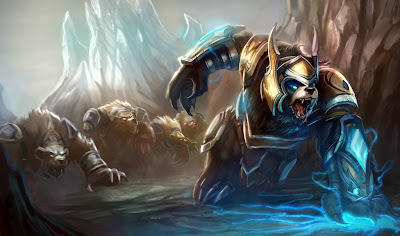 What kind of changes do YOU think would make Volibear more viable? Do you think Riot will overshoot with the buffs and make him overpowered? Comment below! Haha, thanks for the follow Rex! I thnik maybe making his ult a buff for his spells rather than his auto attacks would be nice, maybe increase his bite to do electrical damage over time, or his roar to cause thunder bolts to hit anemies in its cast range for some damage, and his q to leave a trail of some sort of electrical power behind him, similair to shyvanas dragon form burn out, so that it does some damage when they are thrown back. He's a thunderous bear, his ult should show that and enhance his character. I really like volibear so I don't really know if change would be good. But He definitely needs to be faster in the jungle. Voli's main problem (I main him)is he is not a tank (no hard cc) but you need to stack health to a ceartain degree.Your frenzy (health ratio) can be cast 1 per team fight and to be used properly it must be cast when the target is low and this sometimes kills your target (kills should go on carry) . Other than that he is very item dependent, can't catch up to champs with escapes and can't kill most champs 1v1 if not fed a lot. He is very mechanical because you need attack speed to have dmg output but no one will stay still for you to hit him constantly. After ult is down he can t do much. My thoughts are this: make his frenzy shred the armor equal to a percent of max hp opose to granting him more attack speed. That would make you hit hard after you hit your target a bit and give you some added utility in team fight.This would also help with season 3 jungle. Right now it does not matter who you focus because your ulti does more dmg then your auto attack so sometimes it is better to attack tank to grantee lightning keeps jumping as many times as possible. Passive is not that op as people think since a lot of bursters don't let the regen run it's cource(Darius) so they could tweek that so that with each attack he gets more regen or dmg. That would help jungle and make him better as the fight goes on.